Preheat oven to 400 degrees F (204 C) and baking sheet with foil. Rinse and scrub potatoes and cut in half length wise. 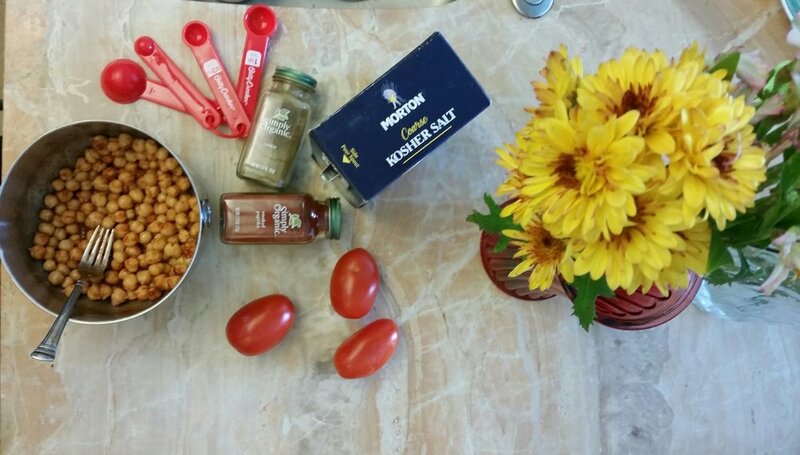 Toss rinsed and drained chickpeas with spices. 4. Place the sweet potatoes to a foil-lined baking sheet and add garbanzo beans and roast for about 25 minutes. 5. While the sweet potatoes and chickpeas are roasting, prepare your sauce by adding all ingredients to a mixing bowl and whisking to combine, only adding enough water to thin so it’s pourable. Taste and adjust seasonings as needed. Add more garlic for more zing, salt for savoriness, lemon juice for freshness, and dill for a more intense herb flavor. 6. Prepare the parsley-tomato topping by tossing tomato and parsley with lemon juice and Kosher salt to taste and set aside. 7. Once sweet potatoes are fork tender and the chickpeas are golden brown - remove from oven. 8. For serving, flesh-side up and smash down the insides a little bit. Then top with chickpeas, sauce and parsley-tomato garnish. Serve immediately.